Which is better for you—silicone or saline breast implants? When considering breast augmentation, there are many factors to consider. One of the most significant decisions you will make is the choice between silicone or saline implants. Silicone and saline implants both have their own unique advantages in terms of their look, feel, and durability. Although Dr. Julio Clavijo-Alvarez can place either type of implant for your breast augmentation at our Pittsburgh, PA practice, he prefers silicone implants due to their natural feel and long-lasting results. Dr. Clavijo-Alvarez can discuss the pros and cons of silicone vs. saline implants during a consultation to help you be well-informed about your procedure. Generally speaking, silicone implants provide the most natural-looking results. This is due to the consistency of the silicone filling, which gives the implants a soft, gel-like feel. These implants reduce the risk for complications, such as capsular contracture. They are also much less likely to show visible signs of wrinkling, making them an excellent choice for patients with minimal breast tissue. Silicone is also lighter in weight than saline, so these implants are not as likely to gravitate downward over time. However, it is important to understand that the natural aging process affects all women’s breasts eventually. Today’s silicone implants have been put through rigorous testing and research, and have been approved by the FDA for women over the age of 22. Silicone implants are also available in a “gummy” version. These implants are filled with a cohesive silicone gel, and are available in different shapes to match your body. Many patients remember a recall of silicone implants in the 1990s. However, today’s silicone implants have been put through rigorous testing and research, and have been approved by the FDA for women over 22. A saline implant is actually comprised of a silicone shell that is filled with a saline solution once the implant is placed in the body. Because saline implants are placed first and then filled, they often require a smaller incision when compared to silicone. They can also be adjusted in size to some degree, even after breast augmentation surgery. Saline implants are firmer than their silicone counterparts. They are also quite round in appearance. However, when placed in women with sufficient breast tissue, they are natural-looking and the roundness is not obvious. Typically, both silicone and saline implants last approximately 10 years, and the risks associated with both types are comparable. In cases of rupture, it would be immediately noticeable for a patient who had received saline implants, as they deflate rather quickly and the natural saline solution is resorbed by the body. Those with silicone implants may not even realize a rupture has occurred, as there is no noticeable evidence. 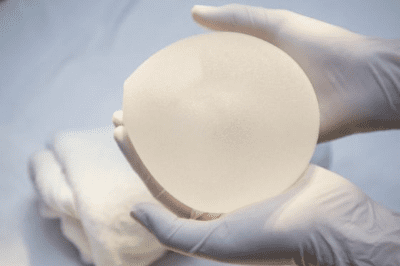 Therefore, women who have silicone implants should attend routine follow up appointments with their surgeon to ensure the implants are still healthy. To choose an implant option that is right for you, we recommend that you determine which issues are the most important to you. Those who desire natural aesthetics above all else will benefit more from silicone. However, those concerned with cost may find more affordable treatment with saline implants. Above all else, it is important that you understand how the amount of existing breast tissue can affect the aesthetic results. Each patient is unique. Therefore, appropriate treatment can vary significantly for every individual. If you are considering breast augmentation and you are interested in discussing your options with Dr. Clavijo-Alvarez, schedule an appointment at ReNova Plastic Surgery. You do so by calling our office at (412) 638-2391 or contacting us online.